Ann Arbor planning commission meeting (Aug. 7, 2013): A light agenda for the planning commission led to two straightforward decisions on rezoning requests for parcels outside the downtown, well away from the area that has generated ongoing controversy. The decisions were both unanimous, with opposite outcomes. The planning commission heard a request to rezone 3325 Packard from R1C (single-family dwelling) to R2A (two-family dwelling) – and voted unanimously to deny that request. A house had burned on the lot, which sits at the corner of Fernwood and Packard. The economics of rebuilding a single-family house and trying to sell or rent it out weren’t realistic, owner Steve Weaver told the commission. A duplex, Weaver argued, could help stem the commercial creep coming from the west at Packard and Platt, and provide a “thumb in the dike” to preserve the residential character of that stretch. In voting unanimously to deny the rezoning request, commissioners encouraged Weaver to work with neighboring property owners with the idea of bringing forward a request to rezone an entire blockface. Weaver has said he will exercise his option to make his rezoning request directly to the city council, even without the planning commission’s support. The other rezoning request on the commission’s Aug. 7 agenda was to designate some city-owned property on 3875 E. Huron River Drive as PL (public land). The move was characterized as a housekeeping step for the planning commission. During the public hearing on the question, one person addressed the commission indicating support, but with some concern about the range of activities that would be promoted there. One idea mentioned at the meeting was the possibility that the parcel – sold to the city in 2010 by former U.S. Congressman Wes Vivian – could become the headquarters for the city’s natural area preservation program (NAP). Commissioners encouraged nearby residents to work with the park advisory commission (PAC) as that group helps decide the parcel’s eventual use within the park system. The commission also heard remarks from the representative of a neighbor opposed to a requested land division on Traver Street. But the decision on that item will be made by planning staff, not the planning commission or the city council. 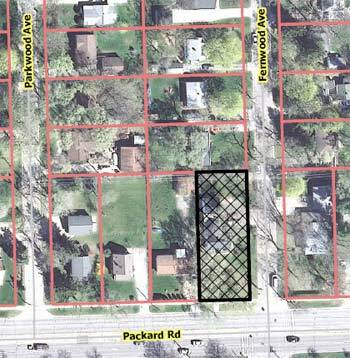 Commissioners considered a request to rezone 3325 Packard from R1C (single-family dwelling) to R2A (two-family dwelling). Packard Road zoning map with the parcel proposed to be rezoned as a duplex in brighter yellow. The owner, Steve Weaver, had requested the rezoning in order to build a duplex on the property, which is currently vacant. The site is located at the northwest corner of Packard and Fernwood, in the Darlington subdivision. A fire destroyed the single-family house there in April of 2012. Planning staff had recommended that the zoning request be denied, because the city’s master plan calls for single-family detached housing in that area. The staff report was given by city planner Jill Thacher. She began by noting that the property is located on the north side of Packard Road on the northwest corner of Fernwood and Packard. She showed commissioners the current zoning map, noting that it is in the South Area in the Swift Run watershed. She described the lot as 11,958 square feet in size with a request to rezone it from R1C (single-family dwelling district) to R2A (two-family dwelling district) so that a duplex could be built. The lot measures 68 feet × 175 feet and is currently vacant, she said. A single-family house previously stood on the lot, but was destroyed by fire in April of 2012, Thacher explained, so the lot is now vacant. Thacher noted that the proposed rezoning would not result in any change in setbacks to the side, rear or front – because the setback requirements would be the same for both kinds of zoning district. Aerial view of 3325 Packard, at the intersection of Fernwood. She pointed out to commissioners that the neighborhood is predominantly an R1C-zoned area but as you move west down Packard Road, there is some office and commercial zoning. Directly across Packard is an R4 district, which is an apartment building, she said. Thacher noted that Packard Road is five lanes wide at this point: “It’s a big road.” She described Fernwood as very residential in character. Thacher showed the commissioners a possible building layout for such a duplex. She pointed out that there are several lovely shade trees that exist on the site. There’s also a driveway curb cut that exists, which served the house that burned down. A sidewalk is located along Packard, Thacher noted. She added that in whatever manner the parcel is developed, a sidewalk would need to be installed along Fernwood as well. A current photo of the parcel taken from the corner of Fernwood and Packard showed it to be a big grassy lot. … because of a change in municipal policy, or because of changed or changing conditions in a particular area or in the municipality generally, to rezone an area, extend the boundary of an existing Zoning District or to change the regulations and restrictions thereof. Thacher pointed out that in response to a set of staff questions asked of the property owner, asking for explication of any change or changing conditions, Steve Weaver had indicated that there were not any. Thacher observed that public services city staff had indicated that connection fees would be charged with any new building permits for the site. Thacher summarized planning staff commentary by saying that the city’s master plan recommends a single-family residential use for this parcel and everything surrounding it on the north side of Packard Road. The area consists of small and moderately sized single-family homes, including those fronting on Packard Road. Packard Road was characterized by Thacher as a neighborhood boundary, and she did not consider the land uses on the south side of the road to be very influential on the north side of the road. Packard Road, Thacher said, is five lanes wide – so it’s a real boundary. Land uses on the south side, she said, are not hugely influential on the existing block of single-family homes on the other side. The master plan supports only single-family use, she continued, and neither the staff nor the petitioner had observed any change or changing conditions in the neighborhood. And for those reasons, she concluded, the staff did not support the proposed rezoning from R1C to R2A. A neighbor who lives next to the property appeared before the commission to say there were trees on the parcel, with branches that were touching the roof of her house. She said she wanted the property owner to trim the branches. The owner, Steve Weaver, told her that he was happy to take care of the trees. 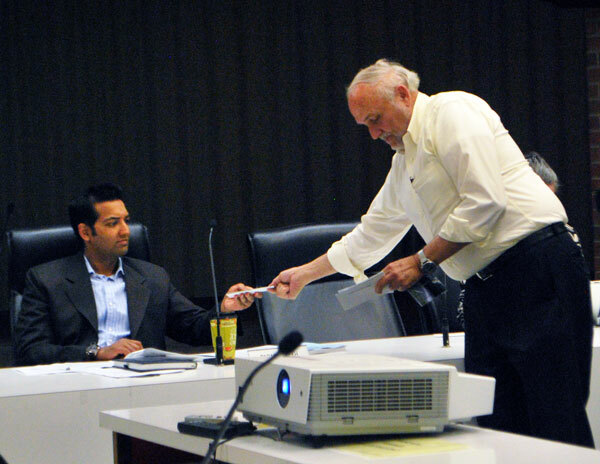 Steve Weaver distributes photographs of the 3325 Packard Road area to planning commissioner Paras Parekh. Weaver distributed some photographs of the area to the planning commissioners – saying that he felt the staff’s photos were also quite good. Scott Betzoldt, with Midwestern Consulting, led off the presentation on behalf of Weaver. He noted that there had been an existing house on the property – an older house that had burned down a couple of years ago. He characterized it as a modest house. It had been condemned after the fire, and was not able to be rebuilt. Betzoldt noted that Packard Road is very busy and it’s not very attractive as a site for a single-family dwelling. It doesn’t really provide an attractive option for someone who wants to purchase a single-family home and raise a family there, he said. The reality of the finances is that building a new home in that area cannot command enough rent to justify the cost of rebuilding. They had looked at various options, including some that were more dense than a duplex, but ultimately had settled on requesting the rezoning as a duplex. In the area there are already duplexes, Betzoldt observed. The lots are not zoned for duplexes, but they are grandfathered in as a duplex use. There is even a duplex that is just two doors down, which is an operating and legal duplex, he said. At the citizens participation meeting, he continued, neighbors had told them that there were several other operating duplexes in surrounding blocks. So Betzoldt said he did not think it was “a stretch” in this situation to rezone the parcel for a duplex. It might be more attractive for someone who is not looking to maintain a yard but who simply just wants to live in Ann Arbor in affordable, new construction. A new structure would be an asset to the neighborhood, Betzoldt said. Adding a new structure would be a positive addition, he said – but if the lot sits vacant, it would have a negative impact on the neighborhood. A duplex would be a very positive addition, he contended. He also noted that the area had changed, working east from the corner of Platt and Packard. Those single-family houses had been converted to commercial or office uses. So the single-family houses on Packard were dwindling – for obvious reasons, he said. Directly across the street there was R4A zoning and adjacent to that there is property zoned C3, with an operating apartment building. There is a C1 parcel, where a convenience store is located. Down the street there is an R4A apartment building. So he contended it was not out of character to have a duplex on the corner. A duplex is still single-family living – but with two families under the same roof. A modern duplex, he continued, looks like a large house. It doesn’t look like a motel. From left: Property owner Steve Weaver and Scott Betzoldt of Midwestern Consulting. Betzoldt showed the commissioners a possible footprint that had been loaned to him from an architect friend of his, for a stacked duplex – with two entrances that both looked like front doors. The attached garage would be accessible to one of the residents, and the detached garage would be available to the other resident. He contended that a duplex on the corner would be a good anchor for the neighborhood. The property owner, Steve Weaver, followed Betzoldt’s remarks. He told the planning commissioners that he had grown up in Ann Arbor and thought of himself as an Ann Arborite, but just didn’t happen to live in the city today. He believed that if you try to build a single-family house on this particular lot and then sell it, then no one would really want to buy it – especially not a young family, because of the five-lane road that would be right in the front yard. So they’d come up with the idea of putting in a duplex – which would appear to be a single-family house when you drove past it. It would look like a standard home, Weaver said, but would provide the living quarters for two families. Weaver also characterized the proposed duplex as a “cornerstone” that would keep other developers from buying up properties long Packard, converting the corridor to increasing commercial use. The encroachment was already taking place from the west, he noted. In the last year and a half, a new oriental grocery store had opened down the street, he said. If a brand-new unit were constructed like the proposed duplex, he continued, that would be a cornerstone to keep the area residential. Weaver ventured that otherwise the parcel would sit vacant – because he saw no way to market a single-family house once it were constructed. So he asked and encouraged the planning commission to provide a positive recommendation, saying he felt it supported the city and city’s residents. Bonnie Bona led off planning commission deliberations by noting that according to the letter of the master plan – which guides the planning commission on making recommendations like this – the decision seems like a “no-brainer.” The master plan calls for single-family housing and it’s currently zoned single-family, and the petitioner had not shown any compelling reason to change it, she concluded. Bona was also concerned about spot zoning: “Our districts are to be districts, not single sites.” She empathized with the challenges associated with the site, however. She was not sure that planning commissioners had any tools available to address those challenges. But she wanted to know what the process would be for changing the master plan for the properties along Packard Road. Jill Thacher of the city’s planning staff responded to Bona by describing how the planning commission would need to put together a committee to look at that area of the city. All the abutting municipalities would need to be noticed that the city was contemplating changing a section of the master plan. There would be public meetings, a recommendation made to the city council, public comments, and the planning commission would eventually act on it. Bona confirmed with Thacher that once the master plan was changed, it would open the door to change the zoning. Bona ventured that single-family small-footprint homes are not a growing market along Packard Road. She asked that planning staff start considering the question: What is an appropriate use along Packard Road? For her, the neighborhood was not defined by Packard Road, but rather by the back of the lots that lined Packard. When she is in the neighborhood, she said, the sites on Packard feel like they are a part of Packard Road. The neighborhood is behind that, she contended. She didn’t feel a strong connection between the houses on Packard Road and the neighborhood. But Bona was not sure what the appropriate use is for those parcels. It could be office or commercial or multi-family, she ventured. She felt that a major road is a perfect place to put a buffer to the neighborhood. But she did not know what the appropriate nature of such a buffer should be in this particular case. She also said she did not foresee that the planning commission would put a study of small residential sites on its work plan in the very near future. So she was not sure where to go with that, saying that there were bigger issues around the city’s major corridors. But she concluded by saying that based on the master plan, she could not vote to recommend approval of the requested rezoning. Both votes at the Aug. 7, 2013 planning commission were unanimous among the six commissioners present. Paras Parekh asked for clarification about the contention that the parcel would not be attractive for the potential buyer of a single-family home. He wondered why it would be attractive to residents of a duplex. He didn’t understand the rationale for one versus the other. Weaver explained that the difference related to the difference between owning a property and renting it. If you build a single-family home, the idea would be to sell it and have a family live there long term and raise their family there. A duplex would be more likely to be a rental – with people coming and going over time. Given the cost of construction on the lot, and what would need to be done to meet code, it would be difficult to make a single-family home a profitable rental, Weaver explained. Originally they considered the idea that the best possible situation for the lot would be multi-family, but after talking to some of the staff, it appeared that would be really tough to get approval. But Weaver noted that there was a multi-family unit right across the street – so the duplex zoning would provide a nice buffer. They had opted to request something that was reasonable and in keeping with the city’s desire to keep it residential. The duplex option seemed like “somewhere in the middle,” Weaver said. Parekh ventured that the issue was less about the experience of living there and more about the economics of building in that particular part of the city. Weaver allowed that was the case – pointing out again that the parcel was on a five-lane road – and it was tough to imagine building and selling a single-family house there. He would have preferred a six-plex, he said, but they had proposed a duplex as a compromise. Parekh came back to the idea that the actual argument that was being made was based on the economics of the situation. Sabra Briere indicated she had the same problem that Bona had brought up – with spot zoning. She allowed that Weaver might be correct in that it would ease the pressure to convert the other single-family houses along the block to commercial or office uses – but Briere pointed out it would increase the pressure to convert them to duplexes. And that is also something that does not – today, in any case – fit the master plan, she noted. The master plan reflects community values, Briere said, very strongly. That can change, she allowed, as the plan is updated about every five years. Briere told Weaver that he had gotten himself into a problem, because it’s difficult to justify spot zoning. Weaver indicated he understood the concern about spot zoning. But he ventured that duplex zoning for this parcel would amount to being the “thumb in the dike.” It would help and support the residence as well as the city. Once a duplex is built and becomes a rental property, he said, that’s additional tax revenue to the city. If you multiply that over many years, that’s a lot of revenue to the city as well as support to the local residents. Wendy Woods also indicated she was concerned about spot zoning. She understood the Weaver’s dilemma, but she took issue with the idea that Bona had expressed – that the houses along Packard Road were not part of the neighborhood to their rear. For those families who live along Packard Road, it is their neighborhood, she contended. She understood the economic challenges, but said that’s not the planning commission’s purview. The planning commission is guided by the master plan, she continued, and she’d not heard anything to convince her that the zoning should be changed at this time. She ventured that Weaver was “between a rock and a hard place.” But she would not support approving the rezoning. Diane Giannola asked about a question raised at the citizens participation meeting. She asked what would happen if the lot were split. Thacher explained that the lot could not be split right now because it doesn’t meet the minimum lot size in that zoning district for both lots. It would have to be rezoned to R1D. 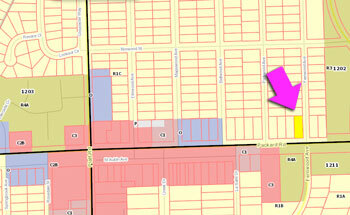 That type of zoning has a 5,000 square foot minimum lot size, which could fit two lots on that site. 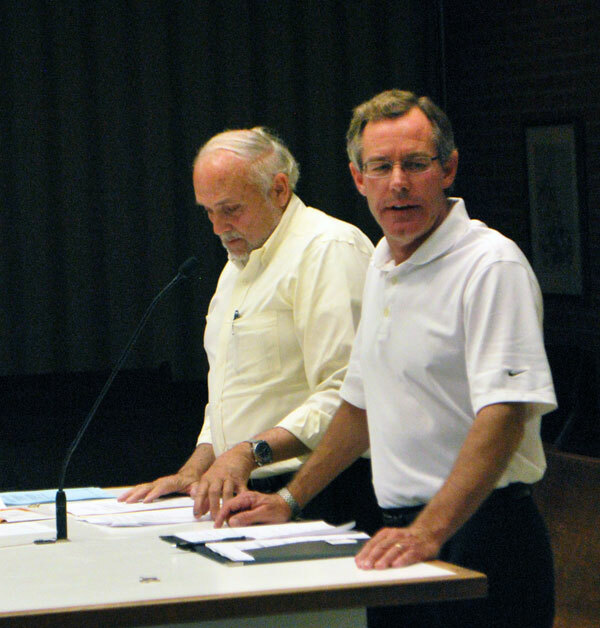 Kirk Westphal indicated that he would echo the sentiments expressed by other commissioners. When proposals like this are brought to the planning commission, it helped alert the commission that there could be areas of concern that needed to be addressed. However, the planning commission had an obligation to uphold the master plan, he said. So he would find it difficult to support rezoning a single parcel. Westphal inquired about a relatively recent neighborhood-initiated rezoning, which had been to downzone an area. He wondered if a neighborhood-initiated effort could also undertake an upzoning in a particular area. Thacher ventured that Westphal might have been thinking of a council-initiated rezoning effort on Golden Avenue. Planning manager Wendy Rampson confirmed that residents in the Golden Avenue neighborhood had requested downzoning, and it had been initiated by the city council – from R4C to R2A. Rampson said that if Weaver was able to coordinate with other property owners in the area, and if there were a sense among the property owners that a whole blockface should be rezoned, that would be one approach to address the spot zoning question. Briere asked for clarification: If the adjacent property owners along Packard Road were to request rezoning to duplex and if it were granted, would those property owners still be able to keep their current use? That is, would they have to set up duplexes? Thacher confirmed for Briere that they could maintain single-family use. In response to a question from Westphal, Rampson noted that the planning commission had in the past made changes to the zoning map without making changes to the master plan. So the zoning map and master plan are not required to be altered in sync. But the city’s planning staff advised that any changes in the zoning map and master plan should be coordinated, she said. Bona asked for confirmation that the existing duplexes in the neighborhood had not been created since the time that the land had been zoned. Bona also countered the thumb-in-the-dike argument by saying that as far as “creeping commercial” uses go, she felt that this would not happen – for the same reason that the planning commission was not comfortable rezoning this parcel for a duplex. The planning commission would have the same problem with rezoning properties to commercial. Bona encouraged Weaver to talk to his neighbors. Weaver asked what his next logical step should be, saying that one of the neighbors he’d talk to had offered to be of assistance in any way he could. Westphal ventured it was a great question to pursue with the city planning staff. Outcome: The planning commission voted unanimously to recommend denial of the rezoning. After the vote, Briere reminded Weaver to trim the tree touching the neighbor’s roof, as he said he would. And Weaver told The Chronicle after the meeting that he’d go ahead and ask the city council to rezone the property, even though the planning commission had recommended not to – which is the right of a petitioner. Planning commissioners considered a recommendation to rezone city-owned property at 3875 E. Huron River Drive from R1A (single-family dwelling) to PL (public land). The site, which is adjacent to the city’s South Pond nature area, will be used as parkland. Map of land on East Huron River Drive to be rezoned as PL (public land), indicated with the arrow on the left. That parcel is on the north side of Huron River Drive. Farther to the east on the same side of the road is the loop of Thornoaks Drive. The property was acquired by the city in 2010, but a “life estate” was in place until earlier this year, according to a staff memo. The two-acre site – located on the north side of E. Huron River Drive and west of Thornoaks Drive – includes a single-family home. The land overlooks South Pond. City assessor records show that the property was previously owned by the Elizabeth Kaufman and Wes Vivian trust. 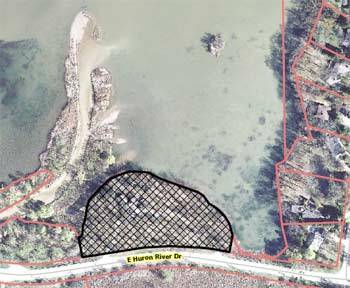 Planning manager Wendy Rampson gave commissioners an orientation to the physical location of the parcel, noting that there is city parkland to the south of the site – the South Pond nature area. Beyond the pond to the west lies the Huron Hills golf course, she noted. She reported that Wes Vivian and his wife had worked with the city in 2009 to sell the property to the city, and the city had closed the deal in 2010. Right now the property is vacant, and the city is considering the use of the former home on the site, Rampson indicated. There’s been some discussion that it might become the headquarters for the natural area preservation (NAP) program or a recreational facility, she said, adding that no decisions had been made. But the rezoning would make clear that the parcel is now part of the park system through the public land designation. Rampson told planning commissioners that it was similar to other rezonings to PL (public land) that had come before the commission, as the city cleaned up the zoning map. Ariel Nicolaci – a nearby resident on Thornoaks – told commissioners he had nothing against the designation of the parcel as public land. He thought it was a good thing. But he had a question: What kind of activity could happen on the land? He wanted to know, for example, if people would be able to rent canoes, or if it would be a camping site, which might draw a lot of people into a fairly confined area. That could generate more traffic, which would require more parking, he ventured. He valued living in the area because of its quiet, peaceful nature. He suggested that it would be helpful to improve the bike lane and pedestrian amenities along the parcel. Sabra Briere indicated that she fully supported the rezoning. She knew Wes Vivian, and knew how much he and his wife had wanted the land to become part of the city’s parks system. She agreed with Nicolaci, however, saying that the use of the parkland was completely unknown. It’s unknown because it’s not planned yet, she said. When the city acquires land for a park, people always want to know how it’s going to be used, but the city doesn’t always have a specific plan for that, she explained. The best thing that residents can do, Briere said, is to work with the parks staff to talk about the current uses in that area and what needs to be improved. Discussing issues like paths along Huron River Drive is one of those things that should be talked about, she said. Huron River Drive is not a wide or a fast road but it has no shoulders in some places – and riding a bike along there is a little scary, she ventured. Kirk Westphal got clarification that for the planning commission, this was essentially a housekeeping item. Planning manager Wendy Rampson indicated that the park advisory commission (PAC) would be the group that will be thinking with staff about the use of the property. So she encouraged the residents to work with the Thornoaks neighborhood association. Whenever a park is planned, even if it is just a playground, public engagement is part of that process, Rampson said. Neighbors are consulted about potential uses and design. She offered some assurance that when things get to that point, there would be communication between the park advisory commission and the neighbors. She again encouraged people to work with their neighborhood associations so that they could, as a group, work with the city. Westphal asked for clarification about what a “life estate” is. Was it a common tool for acquiring property? Rampson indicated that it was not especially common for the city to acquire property in this manner. But she noted that the state and federal government have acquired various properties over time in the northern part of the state, and there are people who own homes or cottages that they are allowed to use as long as they are alive. But when they pass away or if there is some exchange within the family, then it gets turned over to the purchasing entity – the state or federal government. She noted that in the northern part of the state, a lot of homes fit that category. 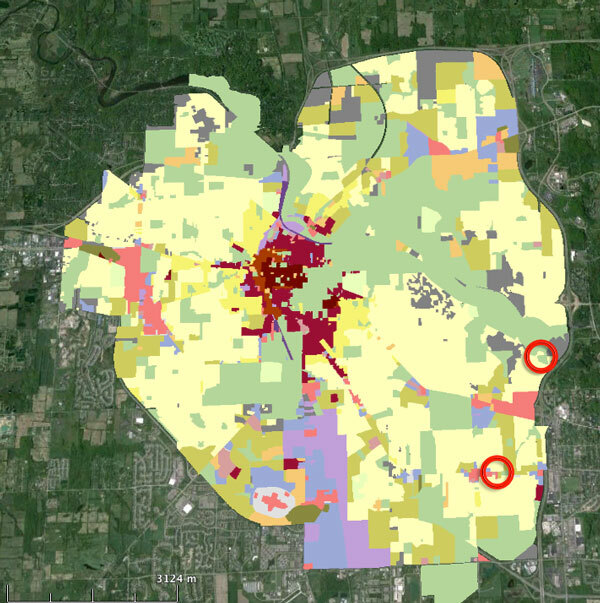 Typically the city of Ann Arbor acquired vacant land, not occupied land, for the park system. But the owners of the land had been longtime supporters of the city park system, Rampson said, and in this case they had felt strongly that the land should go to the park system. Outcome: The planning commission voted unanimously to approve the rezoning of the parcel to PL (public land). 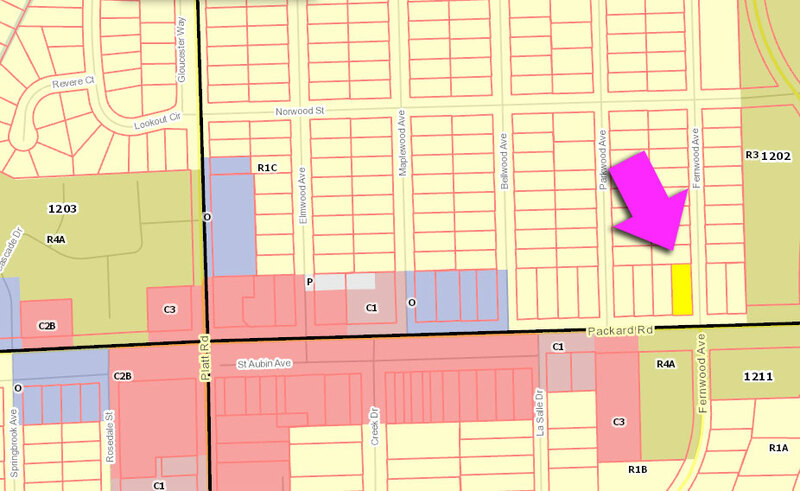 A notice had been published about a property owner request to divide the 0.36 acre parcel at 1643 Traver Street to create a buildable, single-family lot to the north of the existing single-family dwelling located in Ward 1. The land division does not require a planning commission or a city council vote. But it does require public noticing. During general public commentary time, Mark Merlanti introduced himself as the attorney for Igor Kriz and Po Hu, who live at 1639 Traver – adjacent to the land that’s proposed to be divided. They had received a notice of a proposed property division. They are out of the country right now, which is why he was there, Merlanti explained. They had retained him as legal counsel because their neighbor had approached them through a letter about the boundary of the property. The letter had not mentioned the issue of the petition for a land division. He wondered why the neighbor would ask that a survey be done two years after they bought the property. In the context of the proposed land division, he now understood the land survey. Attorney Mark Merlanti talked with city of Ann Arbor planning manager Wendy Rampson before the Aug. 7 meeting started. Merlanti contended that the character of the property could not afford the division. He had looked at the ordinances for Ann Arbor and the state statutes, saying that the state land act has the size width and depth requirements that local ordinances could change. There is also a section that indicates the local standards can take into account topographical and physical conditions. He’d spoken with city planner Chris Cheng, Merlanti continued, who had referred him to specific parts of the city code. He did not know if the resulting size of the two parcels would allow the land to be divided and still fit within the ordinance. If it doesn’t, then he believed that the matter stops there. If it does result in adequately-sized parcels, then his clients’ position is that the character of the Traver Street neighborhood does not promote this kind of split. He’d visited the neighborhood and characterized it as an eclectic area. He characterized the land as “severely sloped” on the part of the parcel that does not contain the house right now. Those are the reasons that his clients are opposed to the land division. At the end of the meeting, Bonnie Bona asked for some additional clarification from the planning staff on the land division item that was included in the packet. She asked if a land division is possible, if the resulting parcel was not buildable. She felt that’s what Merlanti had been suggesting by citing the steep slope. Rampson told Bona that the state statute indicates very clearly that simply dividing the parcel does not guarantee that it is buildable. When the state law was amended a number of years ago, she continued, it removed most of the discretion for local governments on land divisions. The city could look at depth-width ratios and zoning minimums and make sure that the parcel had access to the street and utilities. Even if it looks like it would not be a buildable site, if it meets the city standards then the city is obligated to approve the request, Rampson said. Bona asked if the city planning staff had reviewed the issue yet. Rampson indicated that this was in process and was being circulated among staff for comments right now. 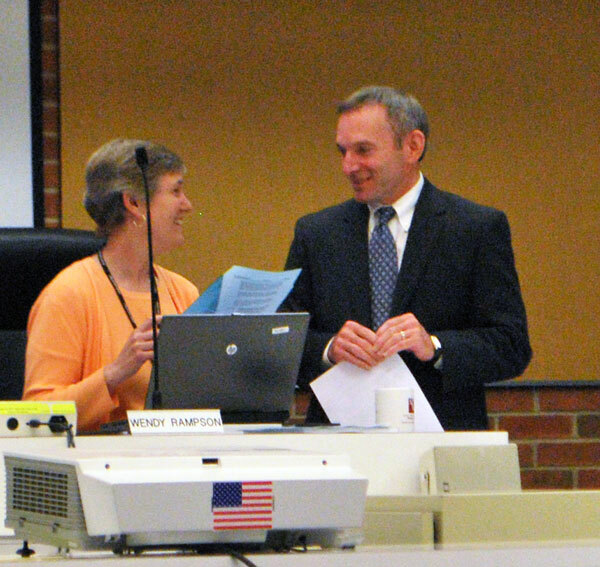 Jill Thacher is the planning staff member who is working on it, Rampson explained. Based on the zoning review, the proposed land division meets the zoning requirements, Rampson indicated. Outcome: This was not a voting item for the planning commission. Present: Bonnie Bona, Sabra Briere, Diane Giannola, Kirk Westphal, Wendy Woods, Paras Parekh. Absent: Eleanore Adenekan, Ken Clein, Jeremy Peters. I live in a neighborhood that has duplexes, and I have to say that they are perfectly in character in a mix of housing that includes single-family houses next door. Indeed, I can’t imagine a neighborhood situation where a duplex would be out of character anywhere in Ann Arbor, especially given modern duplex designs that look like single-family homes. It’s not atypical that on my block a neighbor lives in a home that was built as a single family home, was duplexed in the 1940s, and was unduplexed when she bought it. 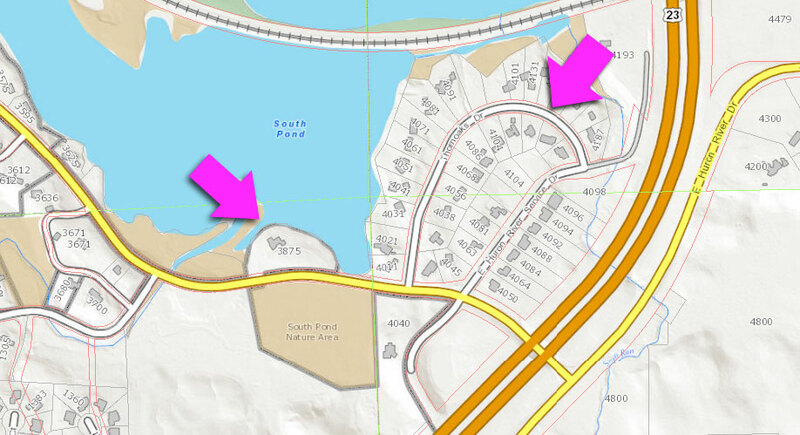 I’m also not sure that the master planning for the area in question makes any sense. Packard is an extraordinary busy street near Platt, and five lanes of traffic means that any single family home is going to be particularly attractive to a buyer. The part of Packard that I leave near is upzoned along quite a length, allowing for a mix of rental properties, small apartment buildings, offices and retail. It’s a good mix, and makes for a more interesting place to live. I’d think that even if the area in question stayed residential that it would be sensible to allow more density along Packard – not necessarily a 13 story high rise, but other dense residential or small-scale commercial or office property that characterizes the rest of the Packard corridor.